Transparent and highly saturated, these alcohol-based inks are suitable for almost any surface. Use them on porous or non-porous surfaces including glass, leather, wood, paper, plastic, metal, metal foil and vinyl. Apply with a brush, pen, airbrush, stamp, sponge or spray bottle. They are indelible and impervious to water once dry, clean up with alcohol and re-wet themselves, allowing for unique effects and techniques not easily achieved with water-based systems. As a dye-based, highly transparent ink, Piñata Colors are unparalleled for vibrancy, and only the most lightfast dyes have been selected for the palette. The new Copper, Brass, Rich Gold and Silver are formulated with REAL metal pigments and are super opaque. The new Pearl is made from mica pigments and is also opaque, and is great mixed with colours to give pearlescent shades. These colours all need a good shake to blend them before use. 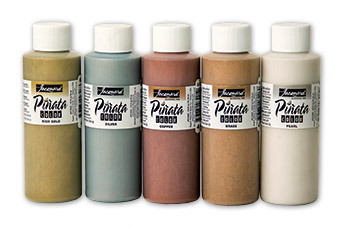 Blanco 030 is also an opaque, pigmented colour, used for creating tints and pastels. We are sorry that we cannot ship these internationally.